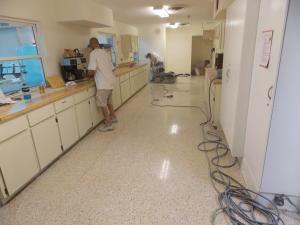 A lot of old Florida terrazzo was covered with carpet. Tearing out carpet, tile, vinyl and everything else is an easy process, but tack strip and nail cause most of the damage we see on terrazzo. Most carpet padding was glued down. All the padding should be removed and the glue should be scrapped. Tack strip should be inspected to see if extra nails were used during installation of the tack strip. Properly installed tack strip on terrazzo flooring should have nail holes drilled into the floor and aluminum nails used to hold the tack strip down. Unfortunately few terrazzo floors had tack strip properly installed. If you see smaller nails heads between larger ones, then there will be damage to the terrazzo. All of the damage can be repaired. These small nails usually did nothing to support the tack strip, but only made chips in the floor. Another problem is steel nails. These nails were, most often, installed with a nail gun and often caused stalling, or chips around the nail. While the nails can be cut, the damage may already be done. There is also likely damage to threshold areas. 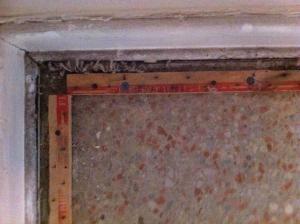 Every time a threshold was removed the nails were most likely pulled. Thresholds nail heads, unlike tack-strip nail heads, are flush with the ground. This leaves no room to cut the nail head. Even the best of restorers struggle to reduce damage from metal tack strips on terrazzo flooring. Many have told me they thought since their terrazzo was covered with tile it could not be restored. That of course is not true. 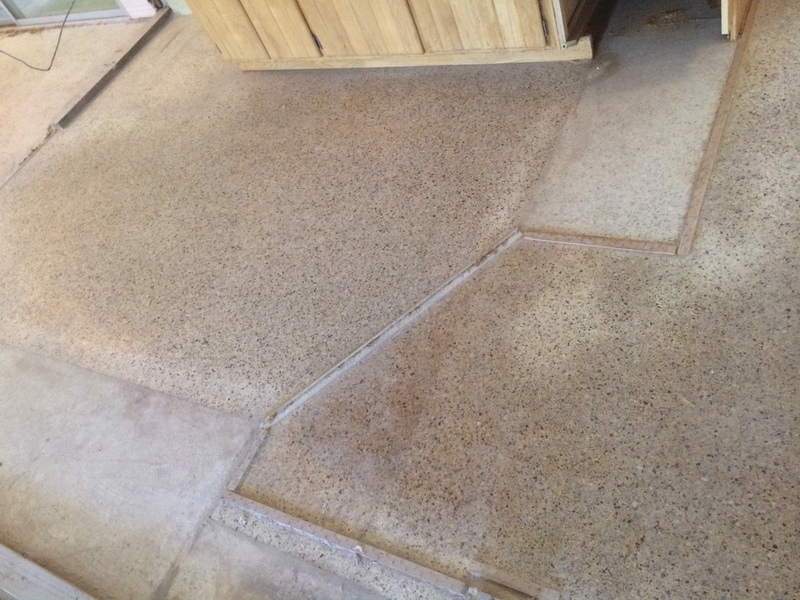 Tile removal does not come without complications, but the tile can be removed and in most cases the terrazzo can be restored and the result is a beautiful, polished long lasting terrazzo floor. 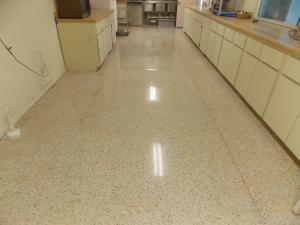 We also have a page showing tile removal and a restored terrazzo floor. When removing tile from terrazzo much caution should be used. First always wear gloves, goggles and safety glasses. A respirator is also advised. The easiest tool to use is a chipping hammer. That is also the tool most likely to do damage. If you use a chipping hammer use a mid-sized one and a floor scraper tool. Make sure to clean the floor often so you know if you are doing damage. If the tool does not keep moving on the floor it will cut the floor. A safer way to remove tile is with a hammer. You still need to use the same safety equipment. Hammer the tile and break it up. This will usually give you the best results. Vinyl tile should be removed with a razor scraper when possible. If this works it is the best tool. If that does not work you should try a thicker scraper. If paper is still present over the terrazzo floor use water to wet the paper backing from the vinyl tile off of the terrazzo floor. 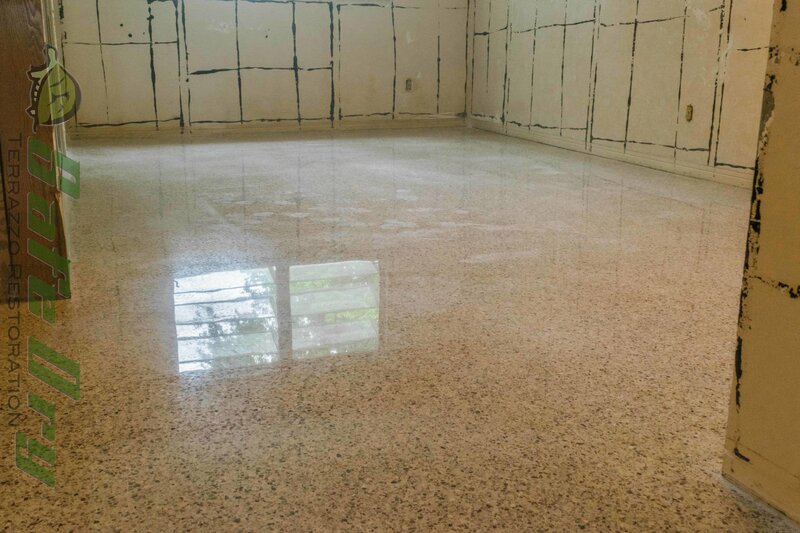 One problem that can arise is that the adhesive can actually hole the tile to the floor so well that when you pull up the vinyl tile pieces of the terrazzo floor come up with it. Look at the bottom of the tile while pulling it to make sure small pieces of flooring are not coming up along with the tile. They will look small, but can cause major problems in restoration. Ghosting from Tile on Terrazzo One of the biggest misconception about terrazzo is that once you install tile the floor can never be restored. That being said there are some problems associated with tile removal, then restoring that terrazzo. One of those problems is ghosting. 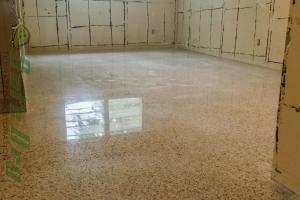 I will never forget restoring a terrazzo floor that had carpet on it. When the floor was wet you could see the grid pattern from tile that had once been on the floor. With that in mind you can understand what ghosting is and where it got its name. Not all ghosting presents in the same way. Some ghosting is clearer when the floor is wet, while other ghosting shows up as the floor dries. 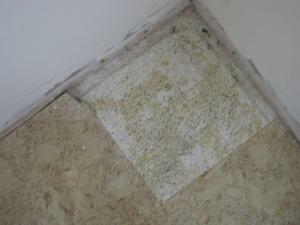 Ghosting is, primarily, caused from moisture trapped under ceramic tile. As moisture travels up the terrazzo floor it cannot escape. The water saturated terrazzo terrazzo can take days, weeks, or even years to dry out. Moisture tends to escape through the grout lines and be trapped under the thin-set and tile. As you can see, in the top picture, ghosting on a terrazzo floor will present as a grid pattern on the floor. The areas where the tile was present are darker and the areas where the grout was are lighter.